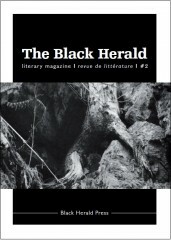 Quelques extraits d'articles parus ici et là / Extracts from a few reviews. Longre seems infinitely aware of the swirling fluidity of each human, separate and together with all that exists. The perpetual swim against the tide of annihilation, useless and exhausting, and yet imbued with the necessary meaning that leads to a knowing that is not like a grasp but more like a smoky awareness of my own existence, rests behind all these beautiful poems, like a rain of water stars. Despite the introduction to my darker self, there is hope. There is a body. There is a tangendental version of real. Longre lets me feel my self with my fingertips. She never preaches at me, but lets me feel my own seeping fluid in amongst the tangled conglomerate of my own version of self hood." 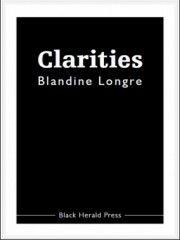 "The uniqueness that is Blandine Longre’s in this collection of poems is twofold, in my opinion. Firstly, she has identified a domain: the powerful complexity of instincts and vicissitudes, and their processes and their drives. Secondly, she has found a language and a form for their expression. It involves neologism, courageous experiment and a fierce intelligence to have kept such a sustained control. There is an immanence of the object in her writing which is entirely compelling. Blandine Longre invites us to share an intensity of seeing, comprehending, reading the other and beyond: responding to the judgment call and interpreting the momentous subtlety of the moment. She has constituted an art of the matter of seeing: seeing in a most intimate and shockingly dynamic way. The irreducible integrity of the image that Pound once envisaged is herein extant. Clarities is an astonishing debut. 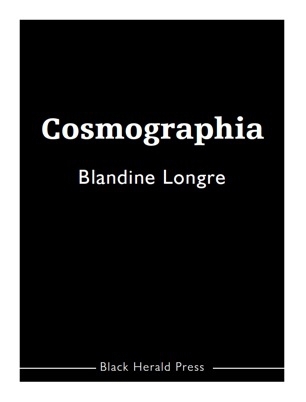 Blandine Longre has unleashed a new, vital, metaphysical animal upon an unsuspecting public. Be warned!" There’s an Ashbery quote, about French being too clear and logical a language for some of the nuanced tonal effects achievable in English. Yet look at what Celine, Genet or Artaud achieved, poetically. Indeed, look at the best poems in this collection. Although written in English, they have the unmistakable clarity and relentless logic of the best French writing."